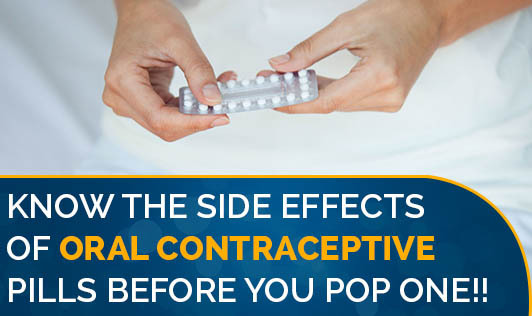 Know the Side Effects of Oral Contraceptive Pills Before You Pop One!! Many are opting for oral contraceptives readily these days. Sometimes they are prescribed by the doctors, but the percentage of popping the pill without consulting a doctor has also gone high in the past few years. As all the other medications, contraceptive pills also have certain side effects, some mild, some severe. The common ones are nausea, stomach cramps or bloating, constipation, head ache, acne, weight gain, irregular and/or painful menstrual cycles, white vaginal discharge, some allergic reactions such as unexplained rash, itching, wheezing, etc. The more severe side effects include shortness of breath, severe depression, breakthrough bleeding, high cholesterol, high blood pressure, chest pain, swelling on hands, feet and ankles, lumps in breast, etc. If you experience any of the above mentioned symptoms, contact your doctor immediately. And as far as possible, avoid taking oral contraceptives for a long period. Always consult your doctor before deciding on taking or stopping of any kind of medications.